Amrith Bdr Subba's Diary|: What we can do with the wastes we produce every day! What we can do with the wastes we produce every day! It was in 1999 when I actually realized the real impact of wastes on our physical environment and economy. Until then, I simply picked up litters from the school campus only because it was what we were required to do during the social works hour and I had not been convinced why it had to be actually done other than making the physical surroundings clean. I was studying in class XI in Khaling Jigme Sherubling Higher Secondary School in Trashigang Bhutan when a team of officials from the Royal Society for Protecting Nature (RSPN) visited us and talked to us during the morning assembly. I still don’t know who the speaker was, but I should really thank him for instilling in me a great sense of responsibility and ownership for the environment I live in. He talked to us about the long-term consequences of non-degradable wastes such as plastic products which can remain in the soil for millions of years, contaminating the soil and underground water. I still remember his words that actually enlightened me: “Even if each one of us throws one sweet wrapper in a day, there will be 700,000 plastic wrappers going into our soil every day that can remain for millions of years. Can you imagine the kind of environment we will be leaving behind for our future generations to live in?” Well, that was the most powerful message, too convincing for a young brain like mine. Since then, I have always endeavoured to dispose the wastes especially the plastic products in a proper place. Whenever I have sweets or when somebody offers me sweets, I always carry the wrappers in my pocket to be disposed into the bin later. I don’t know how many people practice this but at least, I am doing what I can in my own small way. I am also trying to pass this concept onto my wife an children whenever they tend to throw plastic wastes like juice bottles, sweets wrappers and junk-food packets into the drains as we walk along the sidewalks. I have told my wife a couple of times how even a single plastic litter she throws into the drain can cause problems in the years to come. I wish if everybody in the world realizes this, so that we can have a pristine, healthy environment for the millions of generations to come. If we can think a bit out of the box, I have come to learn that there are many ways we can make good use of our both degradable and non-degradable wastes. 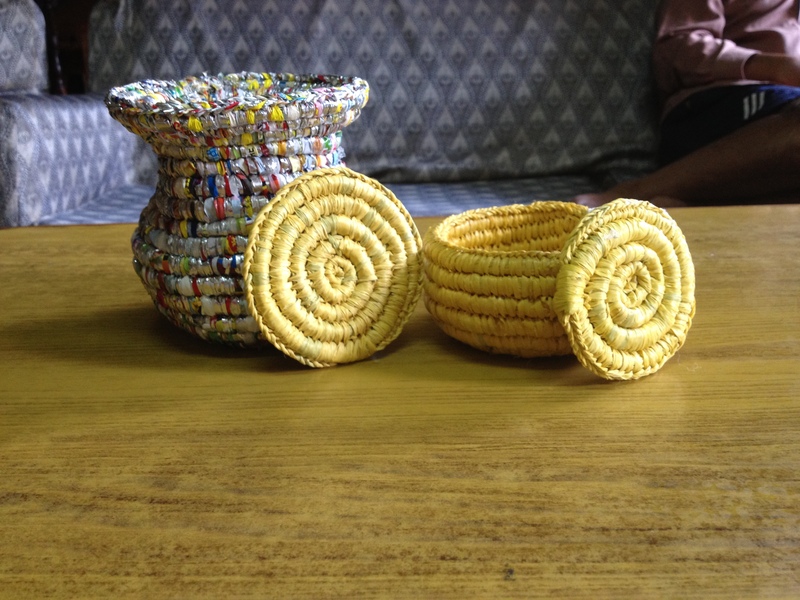 My mother-in-law has woven beautiful baskets of different sizes for different purposes with plastic packets of maggi, Wai Wai and Mimi noodles the kids had. She has just cut those plastic packets into shreds to weave those baskets. These baskets are being used for keeping medicines, flowers and cosmetics. She has also woven a few decorating items that are fixed above the doors for decoration. 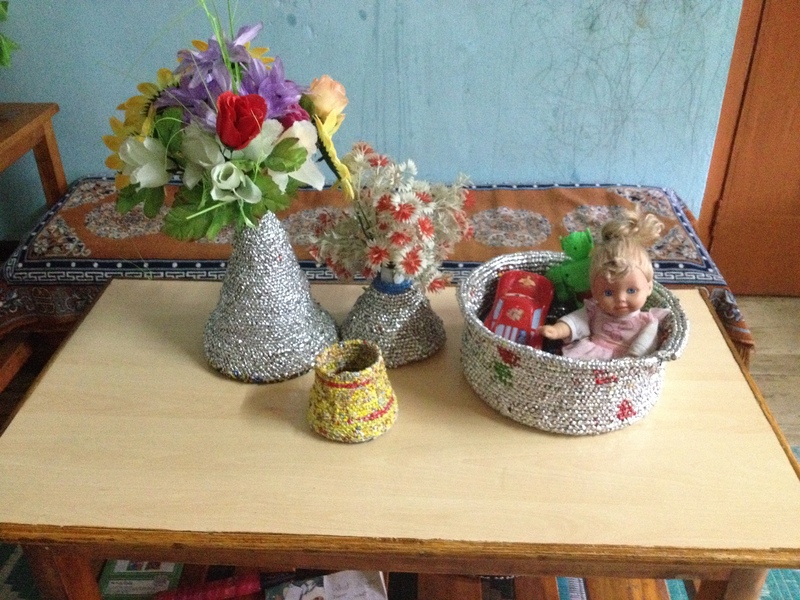 I look at those products and talk to myself that if my mother-in-law had not been creative, those plastic wastes would have gone to the Memelakha landfill long time back. Of late, my wife has also learned a new way of disposing degradable wastes. She has started using the vegetable wastes as manure for the garden which is an excellent idea. 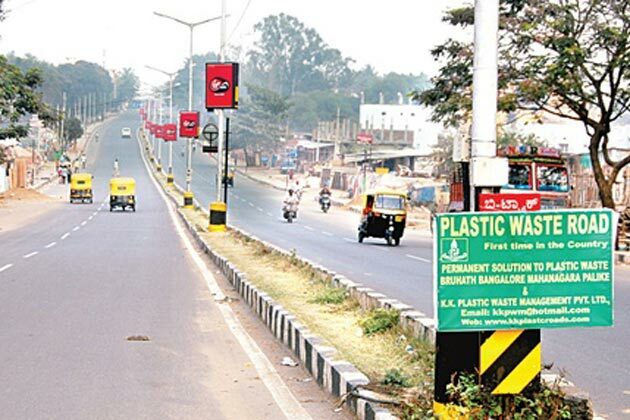 Business Week reports that as of now about 5000 km of roads have been blacktopped with molten plastics in India and the roads are of perfect quality. It is amazing that we produce a significant amount of wastes every day and innovations like these can really help in minimizing our wastes so that our environment will be least affected. Please click here for more information on this topic on Kuensel Newspaper. I see very creative items here. Wow, I am very much impressed by the way you designed them, your thoughts towards waste and preserving our environment. Simply great! Many many thanks, Riku for your kind encouragement.